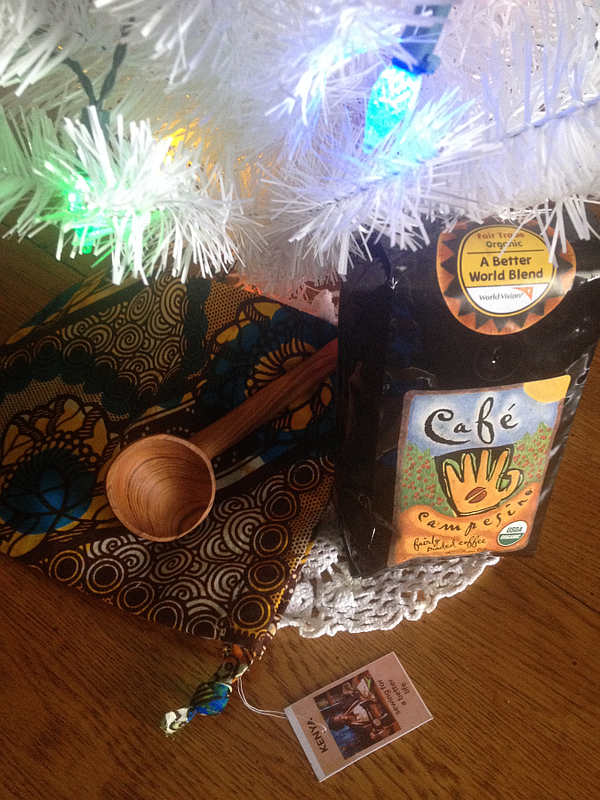 World Vision Handcrafted Gifts with Cafe Campesino Coffee – Get Cooking! In many ways, we’re all becoming more socially conscious and compassionate. In fact, socially responsible giving is growing in popularity and statistics tell us that 95.4 percent of households now give to charity. Faith in humanity, restored! When it comes to gift-giving, many people find themselves wondering which products actually help others or where they can find these gifts. In my opinion, World Vision is one of the first places to look if you’re looking to make a difference in the world. If you want to reach out and directly impact the lives of other people, look to World Vision. It’s the holiday season and that means one thing: It’s time for the wonderful World Vision Gift Catalog! I was blessed to have a History’s First Blend Gift Set sent to me to review on Get Cooking and it’s more than my honor to do just that. 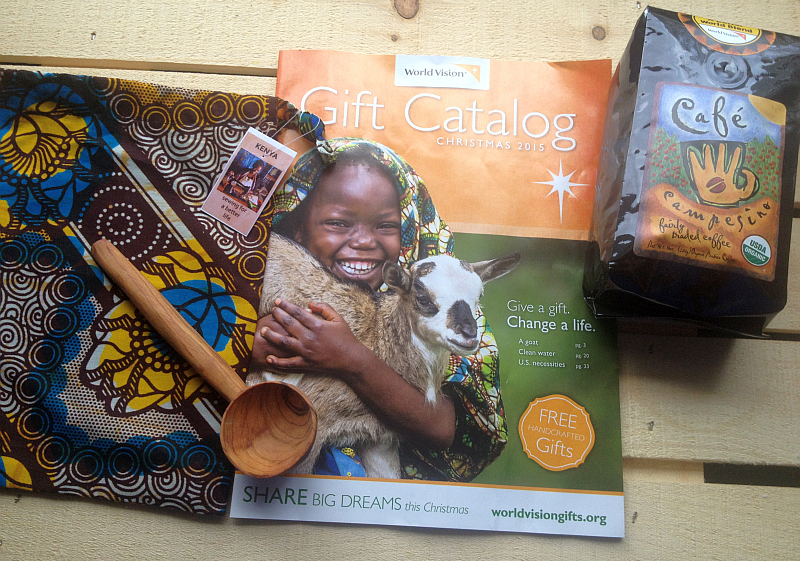 This particular World Vision gift set is the perfect gift for coffee lovers. 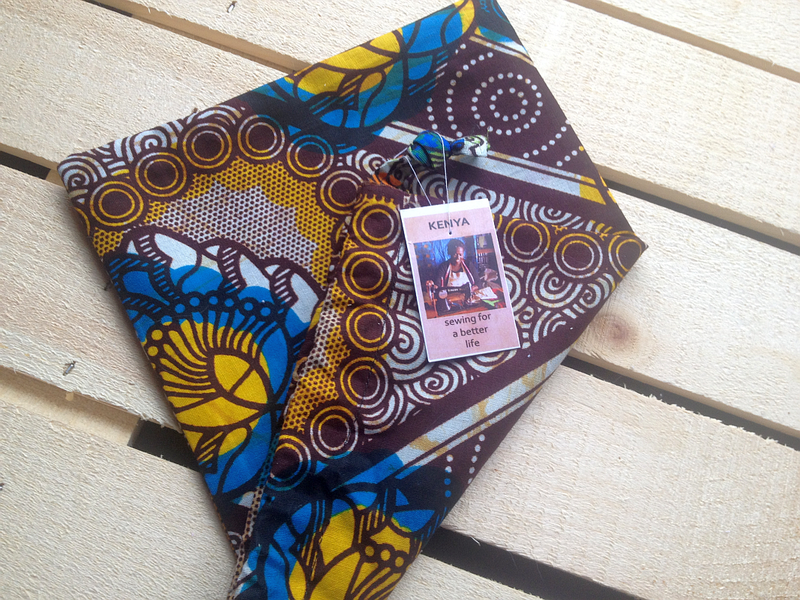 It includes an absolutely beautiful hand-carved olivewood scoop and a colorful, beautiful bag made from African fabric hand-sewn by local women. Although I’m someone who’s serious about as often as an elf on Santa’s staff… and tend to treat each day as a holiday… I want to get 110 percent serious for a minute. Maybe even two. As I’ve said before when talking about these remarkable gifts, each time I hold them, I’m overcome with emotion. The fact that these beautiful gifts were crafted by hands on another continent and can now be held in my own hands leaves me speechless. 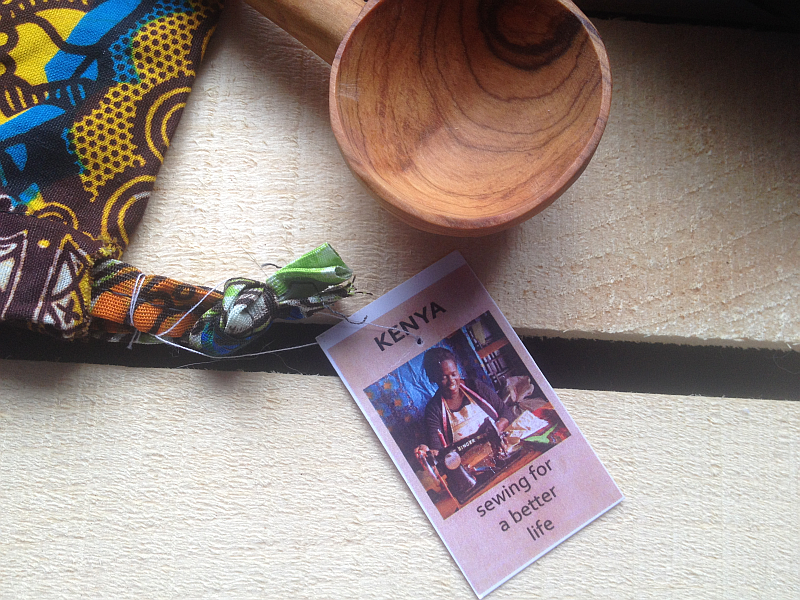 The hands that crafted my treasured bag and wooden spoon lead a different life than our hands. The struggles they have make the perceived struggles we have want to run and hide. We feel discouraged when we think we can’t get our children as many gifts as we’d like, yet there are people around the world who are struggling to give their children food, water, shelter, shoes… things we take for granted. When you stop and let this sink in, don’t you want (with every fiber of your being) to do something to help? Thank God for organizations like World Vision who make it possible to do just that. We don’t have to worry about our money going where it’s needed – they see to it! The truly remarkable thing is that this beautiful program allows men and women to use their talents to help themselves and their communities. 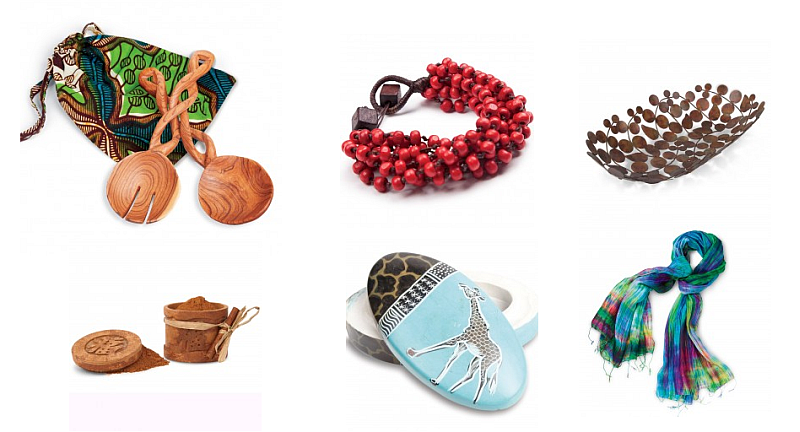 What’s more, by buying their remarkable crafts, we not only help them… we have items to treasure. And I do mean treasure – I wouldn’t take anything for my wooden scoop or fabric bag. I have them proudly displayed on in the “coffee station” in our kitchen. 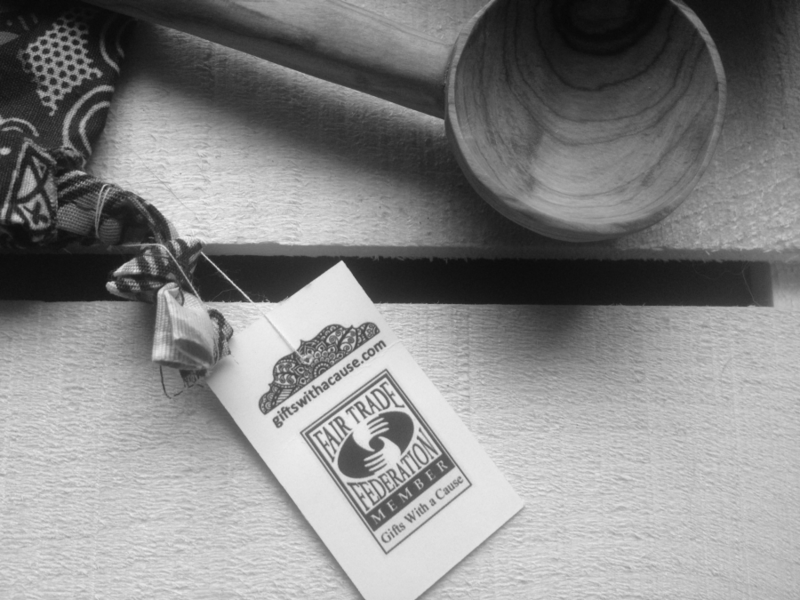 The wooden scoop could easily be used to scoop beans and/or grounds and the bag would love to be a “sleeping bag” for opened bags of beans… and yet… in our home, “treasures” don’t multitask. They simply sit out and remind us of our beautiful brothers and sisters who live halfway around the world. They remind us that we’re all in this together – some of us simply have easier lives than others. 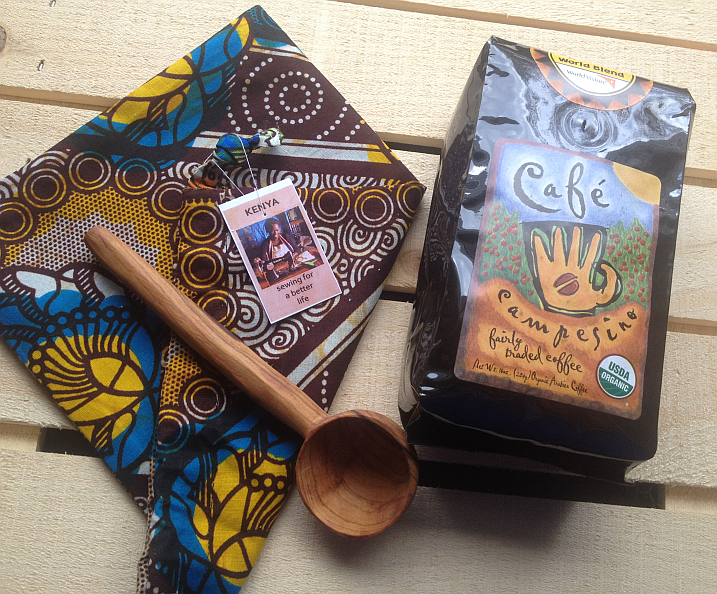 This year’s Handcrafted gift set for coffee lovers includes a bag of Cafe Campesino coffee along with the GORGEOUS hand-sewn bag and equally GORGEOUS handcrafted wooden scoop. Although we’re a coffee loving family to the point of fanaticism, we’d never heard of Cafe Campesino. By gosh we’ve heard of them now! Ethiopian Yirgacheffe and Sumatra Permata Gayo create the first known mix of coffee. When it comes to describing the flavor, think citrus with a hint of chocolate. The flavor is fantastic – smooth and downright exotic. We tend to order a great deal of coffee online and are fascinated with trying different blends and different brands. The fact that this particular coffee was so good and the fact that they partnered with World Vision for something so extraordinary means that this is a brand we’ll be ordering regularly. In other words, look for plenty of Cafe Camesino reviews in the future. They also have coffee merchandise and.. be still my Crazy Tea Chick heart… tea. Looks like I’m going to keep the postal service and UPS busy in the coming year. I hope you’ll click through any of the links and read more about World Vision and the AMAZING Hand Crafted Gifts. Any of these beauties would make the most amazing gifts! They aren’t just gifts people will enjoy for a day, a week, or even a month. These are gifts they’ll treasure a lifetime. Is This a Beautiful Smile or What?! When you click through and browse through the online World Vision Gift Catalog, be sure you see each of the four pages. These handcrafted gifts are simply gorgeous – you can see a few in the image above. Each comes with its own guaranteed moments of emotion each time you look at them. 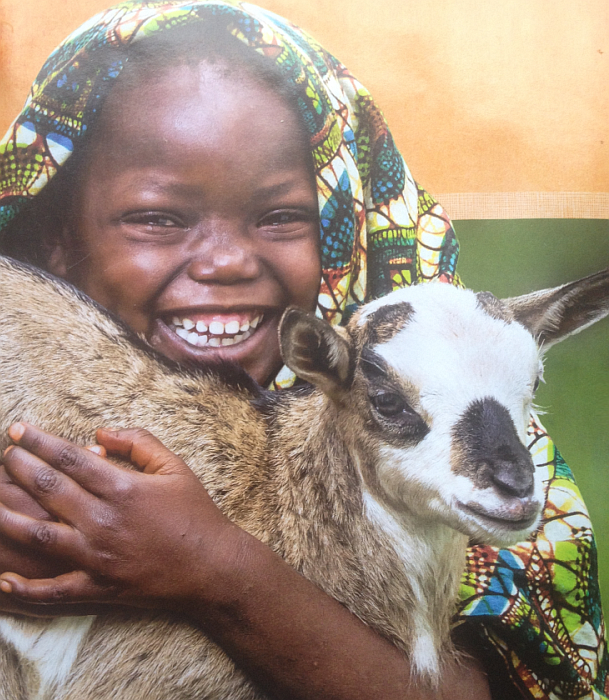 The 2015 World Vision Gift Catalog contains more than 250 poverty-fighting gifts, ranging in price from $16 to $39,000 that improve the quality of life for struggling children and families in the U.S. and around the world.